BEHOLD, LUXURY HOMES THAT OVER-DELIVER IN EVERY WAY. OVATION QUARTER’S FIRST RELEASE, EMERALD, OFFERS 170 SPACIOUS AND SUPERBLY APPOINTED APARTMENTS. These generously proportioned one, two and three bedroom apartments offer an enviable sense of space. All appointed with the finest, sustainable materials and choice of finishes, their intuitive flowing layouts provide for apartment living, not compartment living. 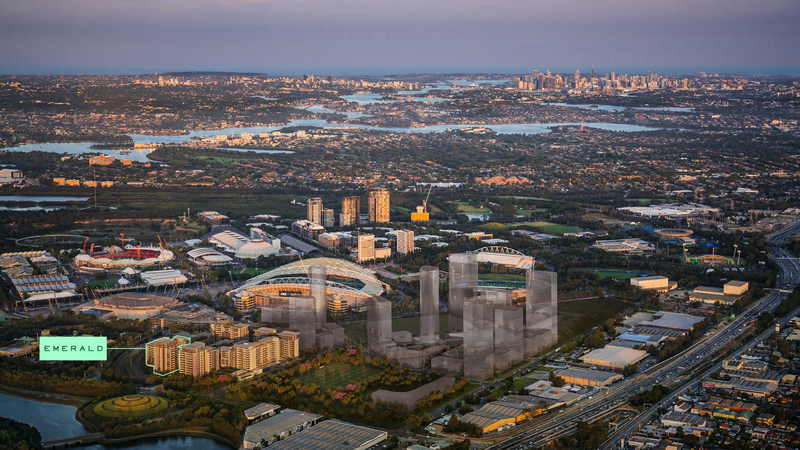 Your money buys you more here and provides better returns too, as the stunning Sydney Olympic Park, which can be seen from your balcony, is the culturally rich and growing epicentre of Sydney. With expansive living, pantry and storage areas, ample visitor parking, parklands and sun-drenched green leisure spaces, Emerald gives you more room to enjoy as well as profit from. Landscaped and water-featured, the two-storey high lobby gives you a feeling of design-inspired space from the moment you arrive. Full height windows and 2.7 metre ceilings in living areas take it further. The two and three bedroom apartments provide dedicated media desks and shelving in the living room, plus the kitchen has oversized island benches with ample under-bench storage. Intuitive flowing layouts provide for apartment living, not compartment living. 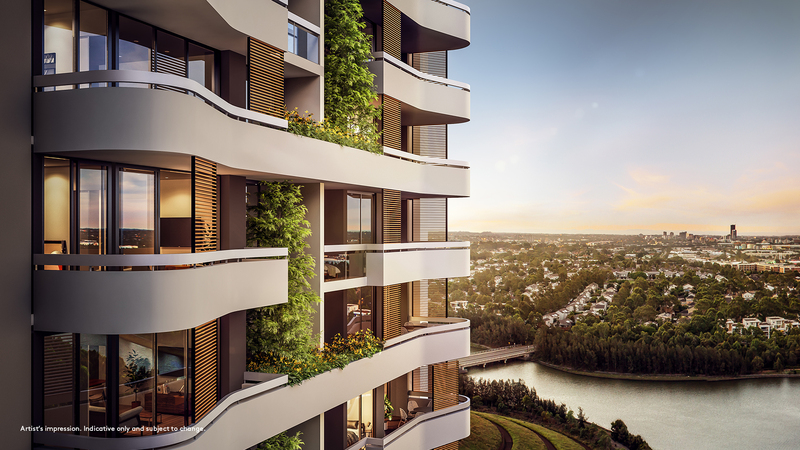 Other smart design features include landscaped vertical planters for privacy and well being, kitchens and laundries with external exhausts, pressurised corridors to keep cooking odours where they came from and services powered by the building’s own solar panels. Superior security systems feature intercoms and remote access control for lobbies and carpark, while the lifts have regenerative drives which lower the building’s carbon footprint. It’s this type of technology-enhanced living that make Emerald a very astute decision. 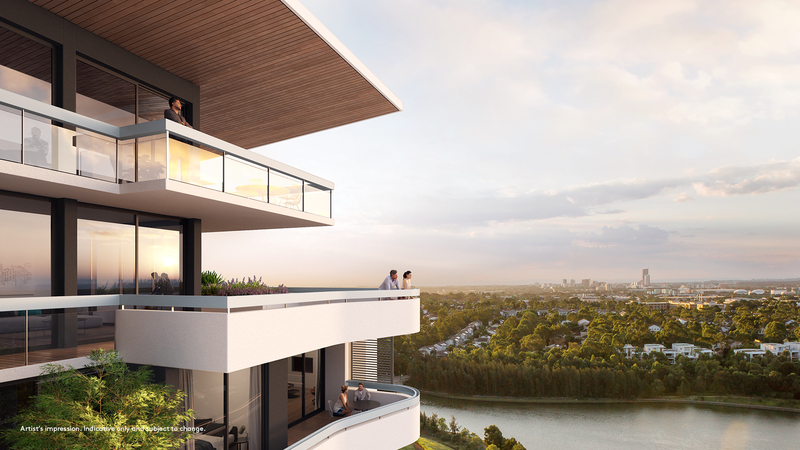 The timber-style engineered flooring flows seamlessly onto unique curvaceous balconies. The bathrooms feature stunning freestanding bathtubs custom-made for Emerald by Parisi, as well as premium fixtures and fittings which even extend to the laundry. The frameless shower screens and full-height feature walls create a unsurpassed sense of luxury. The kitchens feature European appliances, while the living and bedrooms enjoy zoned reverse-cycle air conditioning. It’s not often you discover finishes and features so much more premium than the price. 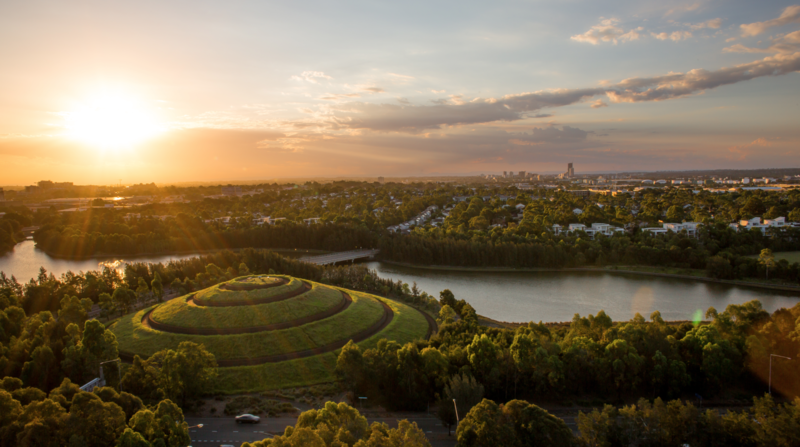 Sydney Olympic Park has long been a major centre for entertainment, sport and lifestyle. It’s since become a major population epicentre in Australia’s largest city. This means commercial and employment opportunities are growing and the entire area will become even more sought after. Emerald at Ovation Quarter is a rare jewel which you can enjoy now and be rewarded with later. Our generous, luxury one bedroom apartments mostly feature a two-way bathroom and a balcony or courtyard. Your choice of three beautiful interior finishes, ranging from light to dark, are complemented by quality textures, fittings and appliances. These well-appointed, spacious two bedroom luxury apartments make for maximum use with high ceilings and generous proportions to give you a home that feels light and airy. 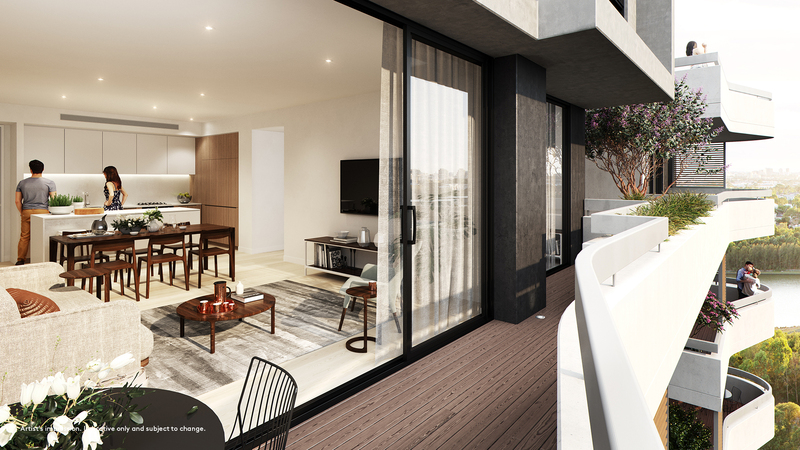 Every apartment features two bathrooms while the balcony or courtyard offers amazing views of the surrounding parks and across the Sydney cityscape. 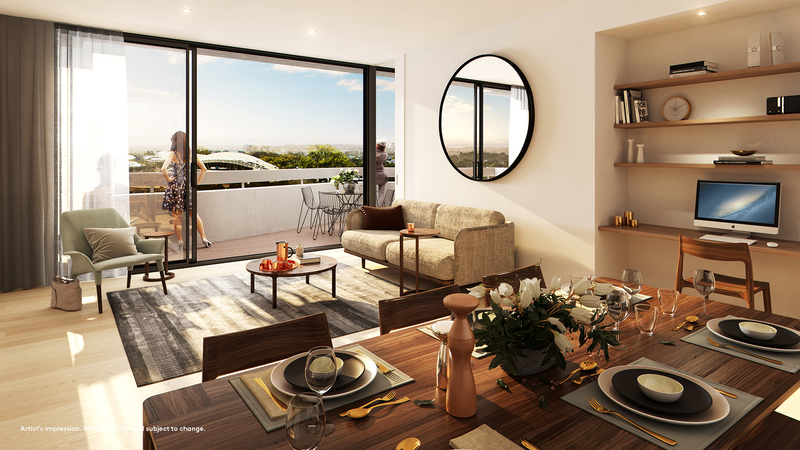 Our oversized three bedroom apartments have been carefully crafted to provide maximum enjoyment and liveability. With extensive living spaces of 157m2 and some enjoying a massive 256m2, there’s plenty of room for families to stretch out and enjoy. The extensive courtyard or balcony adds the perfect space for entertaining. High quality fittings and a thoughtful use of materials completes the feeling and look of luxury.